An opulent purple hue with a rich, intense nose of ripe black cherries, rich oak and warming vanilla. In the mouth, the wine is smooth and full-bodied with ripe black fruits and notes of black olive, mint, vanilla and spicy black pepper. The tannins are velvety and fine-grained, complementing the long, oaky finish. Ideal to serve with fine steaks, other red meats and rich cheeses. 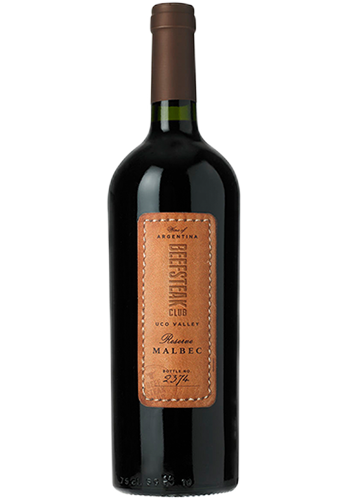 Beefsteak Club Reserve is crafted from hand-picked Malbec grapes grown in selected high altitude, clay-based vineyards in Mendoza’s Uco Valley. The wine is fermented in small concrete casks for a rich, complex profile and is aged in French oak for 18 months for outstanding texture to compliment a fine steak.